The Natural Capital - find us now at TheNaturalCapital.com: Want to See More? Use Your Ears. We don't check for updates - you may want to check in with the trip leaders or sponsoring organizations! Want to See More? Use Your Ears. What is your primary experience of a walk in nature? For most people, it is what you see: the greenery, the scenery, the occasional animal. That's all well and good, but if you really want to experience nature, don't depend just on your eyes. You'll see a lot more if you use other senses to help you know where to look. In this post, we'll explore sound: how can your ears help you see animals you might otherwise miss as you're just walking down a trail? Bird songs. Every bird species has its own distinctive set of songs and calls. It can be an overwhelming task to learn them. Start by just distinguishing among the songs. Some are high-pitched, some are lower. Some have lots of notes, some have just a few. Once you can tell them apart, pick a song and try to spot the bird that goes with it. If you make a connection between the visual and the sound, it's much easier to remember which bird makes which noises. As you learn them, you'll be better able to decide which ones are worth stopping for. That little brown bird? Maybe not. An indigo bunting? We'll stop every time. Bird alarm calls. In addition to their normal song, most birds also have an alarm call. If you hear several birds in a concentrated area making insistent, repeated chirps, stop and check out what they're so upset about. Sometimes, you won't be able to figure it out. But we have seen many hawks this way, as well as owls, large rat snakes, and foxes. Other animal alarms. Deer will generally freeze quietly when they first see you, giving you no aural cue to their presence. But if they feel more threatened, they'll snort before they run off -- usually giving you time to spot their white tails in flight. Beavers will let you know they're there as they slap the water with their tail before they duck under the water. If you sit quietly, they might come back up. Rustling in the leaves. Usually it's just a squirrel. And sometimes a tiny insect can make a big rustle. But if you stop and look when you hear something, you can also be rewarded by something larger: snakes, toads, voles, and other ground-based critters. Close your eyes. It's hard to get around the fact that vision is our dominant sense. So try this: stop, close your eyes, and just listen for a while. Try to separate out all the sounds. What do you hear? Is there water nearby? A road? An insect buzzing around your head? How many different birds can you hear? 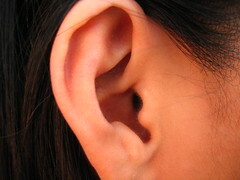 Directional hearing. 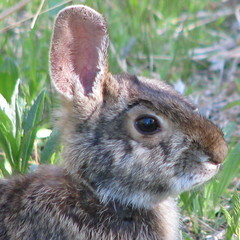 Many animals have big ears they can point in a certain direction to focus in on a sound. Our ears are a more all-purpose design. But you can mimic the parabolic dish of a dog's ears by cupping your a hand behind each ear and turning your head in the direction you want to focus in on. We do this naturally when we cup a hand behind an ear when we haven't heard someone. Be quiet. If you are talking loudly with a friend, it will be harder to hear everything around you -- and many animals will run away from you entirely. We have some friends who have agreed to spend the first 10 minutes of every hike together in silence. It's a nice way to center yourself and be present. The rest of your hike will be better for it. Do you have other ways you use your hearing to experience nature more fully? Experiences with these techniques? Post a comment.